Jessying - Malaysia Beauty Blog - Skin Care reviews, Make Up reviews and latest beauty news in town! 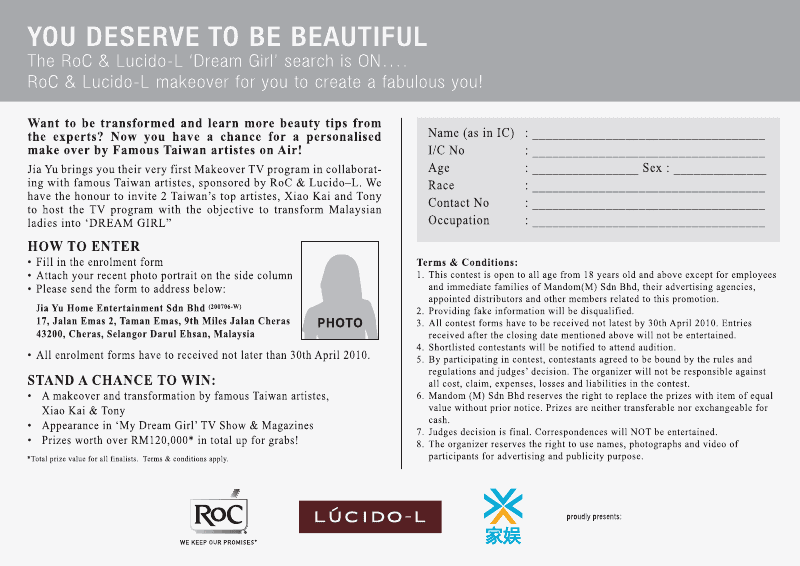 : ROC and Lucido-L "Dream Girl" Search is ON now! 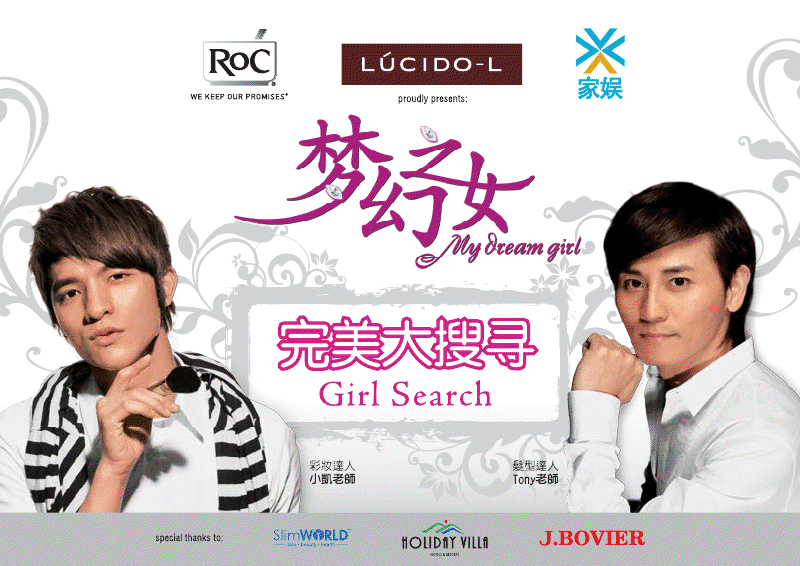 ROC and Lucido-L "Dream Girl" Search is ON now! Received an email from ROC. Greetings from the RoC Skincare team! First of all, we would like to take this oppurtunity to say thank you to all for your support towards RoC through out the years. This year is a great year for RoC, besides of good products being launched this year, we are also taking this oppurtunity to share some interesting news to everyone! Jia Yu Channel (astro 304) together with RoC & Lucido - L would like to present to you their very FIRST Makeover TV program ‘MY DREAM GIRL’. This program will feature renowned Taiwan artistes such as Xiao Kai (小凯老师) and Tony (Tony老师) as the main hosts. Metamorphosis of these lucky Malaysian ladies into DREAM GIRLS will be broadcasted in August 2010. Both Xiao Kai & Tony, will be guiding 13 ladies on their journey to being the ‘talk of town’ and the most envied women in Malaysia. They will also share their knowledge with the audience on how beauty is not just based on trend and season, but how beauty can grow with age. The contestants will be selected from different age group and background. They will be taught from different aspects of beauty tips, from head to toe. Xiao Kai and Tony will not only be sharing their secrets, but they will also identify the problems that are obstructing these women from maintaining their beauty regime. Meanwhile, the host of ‘Fun Travel’, Faye will be highlighting this entire make-over show by Xiao Kai and Tony through the ‘Mary Go Round’ TV program. The participants will also be interviewed, sharing their feelings and excitement of being part of this TV show which as a result, will change their lives. 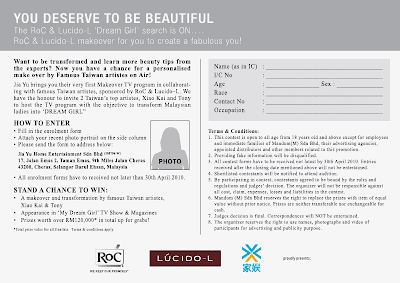 Malaysian women who are interested to get a makeover and learn the art of beauty can access the entry form via www.jiayu.tv or www.lucido-l.com.my and email to mydreamgirl@jiayu.tv or RoC &; Lucido – L counters (Klang Valley) starting from 1st April 2010 to 30th April 2010. Besides that, you can just fill in this form and attached with your current picture and email it back to us!!!! As much as I love makeover ( and this totally looks interesting to me ) however appearing in TV show is a whole different thing! Any of you applying ?